Attorney-at-Law Mr.Shiral Lakthilaka, Private Secretary to the Constitutional Affairs Minister, said with the take over of three key ministries by the President the implementation of ceasefire agreement, development activities and providing humanitarian assistance to affected people has been facing several difficulties. At the commencement, the Director of the CWD Ms Saroja Sivachchandran outlined the objectives of the seminar. Jaffna District Humanitarian Agencies Consortium President Mr. S.Paramanathan presided over the panel discussion on "Ideas for improving the next phase of peace negotiations." Dr. A.Thayalan also spoke. Former Jaffna Municipal Commissioner Mr.C.V.K.Sivagnanam presided over the panel discussion on "LTTE proposal for the interim administration and the future of United Sri Lanka." 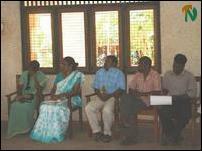 Mr.Shiral Lakthilaka participated in the discussion. In the after noon session Professor P.Balasundarampillai presided over the panel discussion on the topic "The present constitution as a major obstruction to the peace process." Mr.Kalinga Indra Tissa spoke. Mr.Shiral Lakthilaka further said he understood the feelings of the Tamil people who have been affected by the Prevention of terrorism Act (PTA). Such harassment should not continue in the future.
" My ministry has been conducting awareness programme among masses to enlighten them on the federal concept. We have been taking steps to enlighten the masses about the set back now being experienced in the peace process", said Mr. Lakthilaka. 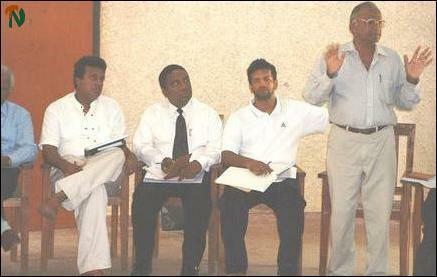 He added," We accept that Tamils should be given the right of self-determination".